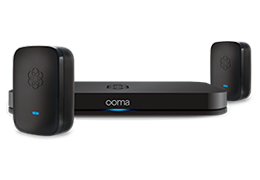 Ooma Office combines the ability to have unlimited lines for your business with an easy do-it-yourself setup and reduced monthly service costs. We offer a full suite of business phone features designed to deliver a great communications experience to inbound callers before, during and after business hours with settings you can control from anywhere. Our virtual receptionist can help answer frequently asked questions and keep people engaged with your business when you're out of the office or otherwise unavailable. To learn more about Ooma Office features, visit the office phone service page for more information about how our service can streamline your business communication needs. Can I use my cell phone to make and receive Ooma Office business calls? Can I make international business calls using Ooma? Can I keep my existing business phone number?